GPUs are single most important part of a gaming PC, but how do they work? GPU stands for Graphics Processing Unit, which is a chip that’s paired with memory modules, display outputs and a cooling solution to create a graphics card. This slots into a PCIe slot on a motherboard, allowing the PC to display graphics on a monitor, GPUs make calculations based on instructions they receive from the CPU, rendering the geometry of a 3D game on screen multiple times per second. The more intense the game and the higher the resolution, the more powerful the graphics card needs to be for a playable experience. The highly parallel nature of GPUs (meaning they processes many calculations simultaneously) also makes them ideal for deep learning algorithms, self-driving cars and accelerating various 3D rendering and video applications. The exact capabilities of a GPU are derived from its internal architecture. AMD and Nvidia, the leading GPU vendors, have their own individual GPU designs, but they share some common traits. GPUs are made up of thousands of individual floating point units (FPUs, chips that excellent at crunching numbers), which are ideal for tackling the complex math of 3D rendering. FPUs are paired with other specialised chips along with super-fast memory for storing and accessing data (in a game, that’s usually the textures that are applied to 3D objects). Classically, GPU performance is measured in teraflops, which indicates how many calculations can be made per second. The higher the number, the greater the performance. While teraflops gives a rough indication of GPU performance, there are a number of factors that affect it. That includes the cooling solution used, the amount and type of memory it has (aim for no less than 4GB of GDDR5 for high-settings 1080p gaming) and software and driver support in Windows. The latter is why AMD and Nvidia issue regular software updates. If you’re suffering from unexpectedly poor performance in a game, chances are it’s because you need a driver update. The vast majority of 3D games use a rendering technique called rasterization, which is the process of taking 3D geometry and mapping it to a 2D pixel grid. This process, developed to minimise the use of GPU resources, is relatively easy for modern GPUs. 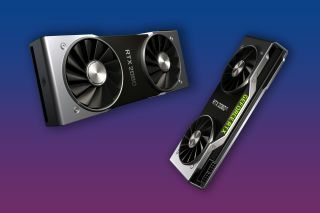 Nvidia’s brand new RTX cards work differently. While they still excel at rasterization, with the RTX 2080 Ti being the most powerful gaming graphics card around, RTX cards are explicitly designed to enable ray tracing. This is a highly realistic, but computationally expensive, form of rendering 3D graphics. RTX cards are the first to enable real-time ray tracing, resulting in lifelike lighting, reflections, and shadows. Such levels of realism go far beyond what’s possible using traditional rendering techniques. Both the RTX 2080 and RTX 2080 Ti have processing cores explicitly designed to speed up ray-tracing, as well as Tensor Cores that deliver AI computing horsepower. Unfortunately, at launch, only a handful of games support Nvidia’s new RTX features. It’s easy to work out which graphics cards are the most powerful. Generally speaking, the higher number, the more performance you get. The first number in an Nvidia card is the series (i.e. 10-series or 20-series) and the penultimate digit the performance. For example, an RTX 2080 performs better than a RTX 2070. AMD cards are trickier. An RX 580 is better than a RX 560, but a Vega 56 is better than both. Always check independent online reviews if you’re unsure. Brought to you in association with Currys PC World. Buy gaming laptops, desktops, components and more at Currys.co.uk.